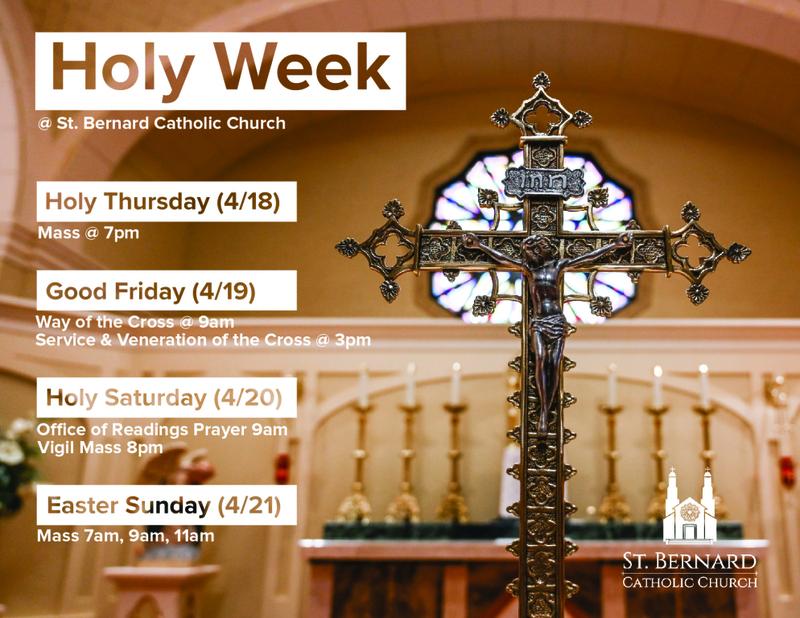 Welcome to St. Bernard Catholic Church Parish! If you are new to our area, we welcome you and want you to be a part of our Church family! Registering begins by clicking on the Registration tab, visiting or calling the parish office (337-332-2159) or by using the bright yellow cards found at our church exits. Using envelopes or giving online identifies you and your family as active and practicing for the purpose of Baptism, First Communion, Confirmation, and Marriage sponsorship and for Catholic School enrollment. 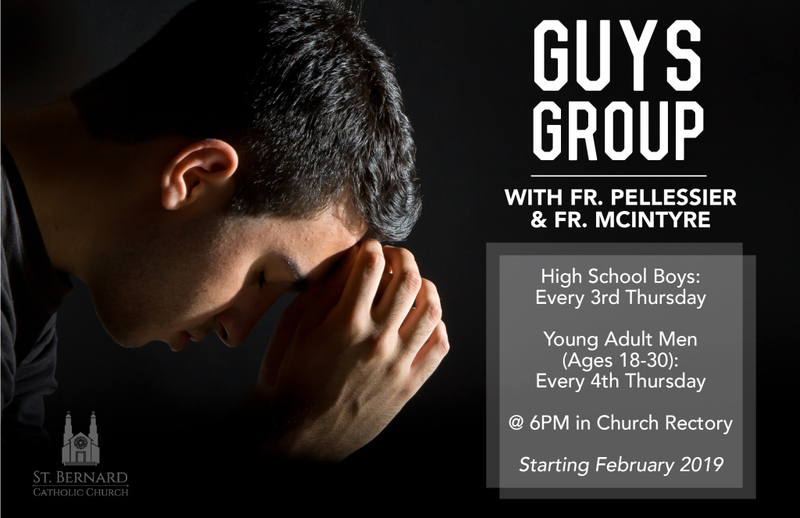 GUYS GROUP with Fr. McIntyre & Fr. Pellessier starting in February. 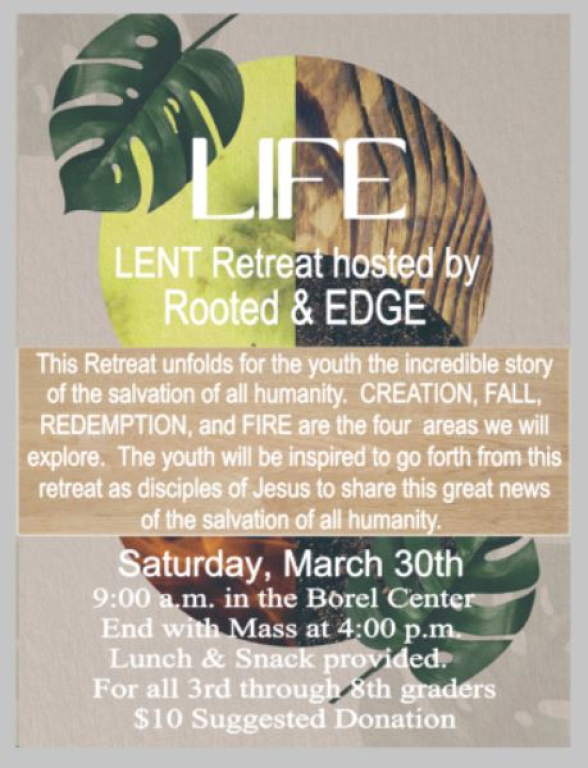 See flyer below for details! 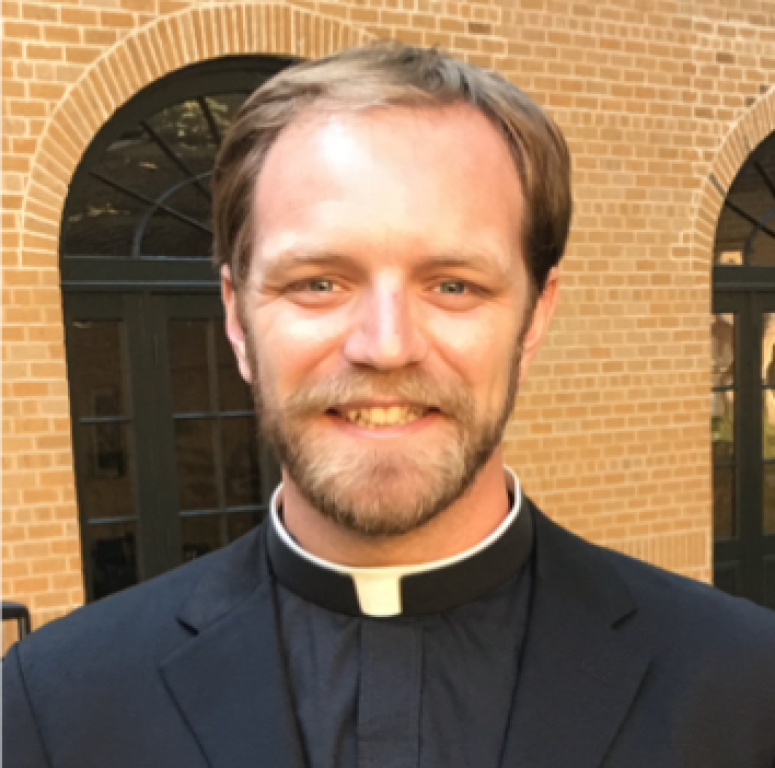 Please see the weekly bulletins for Diocese of Lafayette Centennial News. Help us celebrate a Century of Love! St. Bernard Church will accept non-perishable food donations every first Sunday of the month. These items will be donated to the St. Bernard/St. Francis Food Pantry. ONLINE GIVING IS HERE AT ST. BERNARD. See the bulletin or flyers in church or simply click above on Online Giving for step by step instructions. 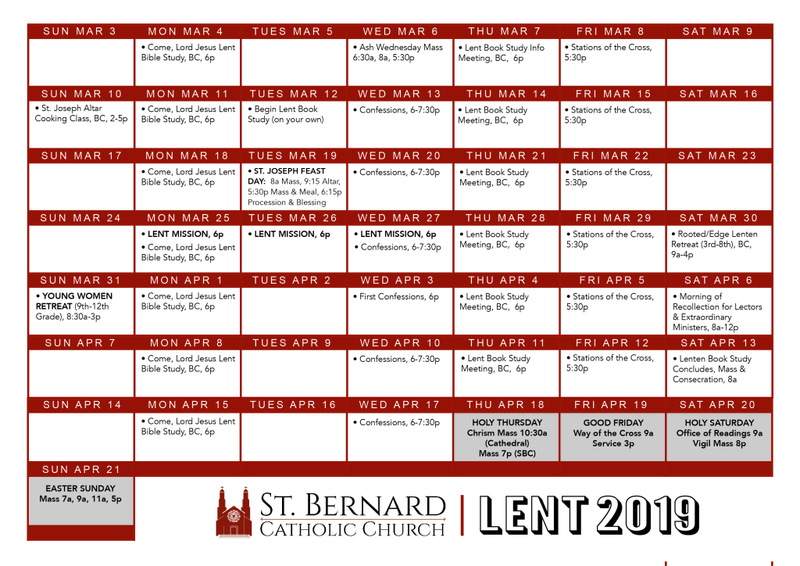 To welcome the active; To seek the inactive; To celebrate the beauty of Christ present by prayerfully working to meet the physical, emotional and spiritual needs of all through the intercession of St. Bernard. This is our mission! This is our challenge! WE WELCOME YOU TO PRAY WITH US, SING WITH US, BELIEVE AND REJOICE WITH US. 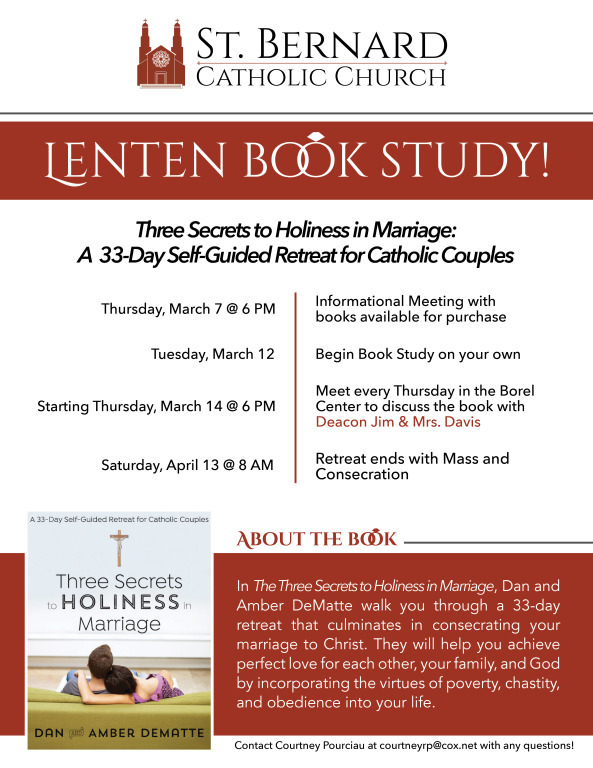 To register with the parish, click here. Join us for a journey of a lifetime on a Pilgrimage to the Holy Land with Fr. McIntyre! October 12-21, 2020. The Scriptures will come alive as you visit Our Lord’s homeland. 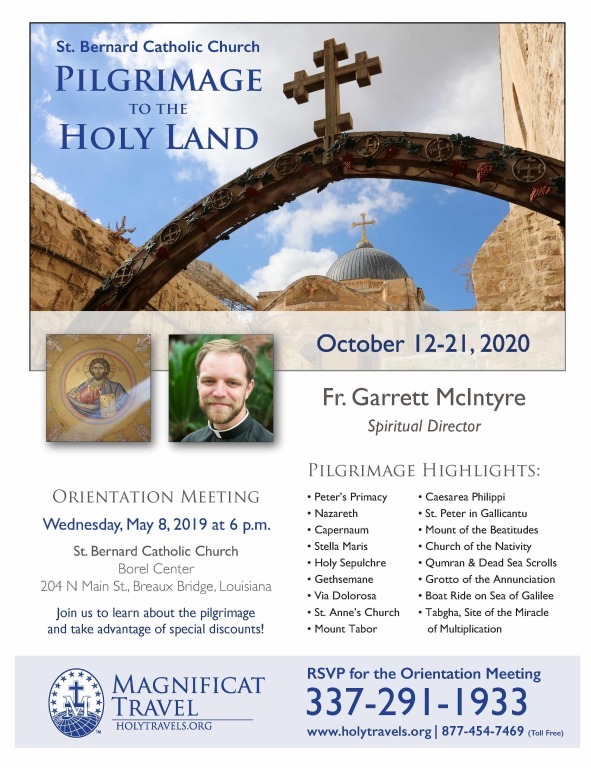 Learn more and RSVP for the Orientation Meeting on Wednesday, May 8 at 6pm in the Borel Center: holytravels.org/stbernardch. 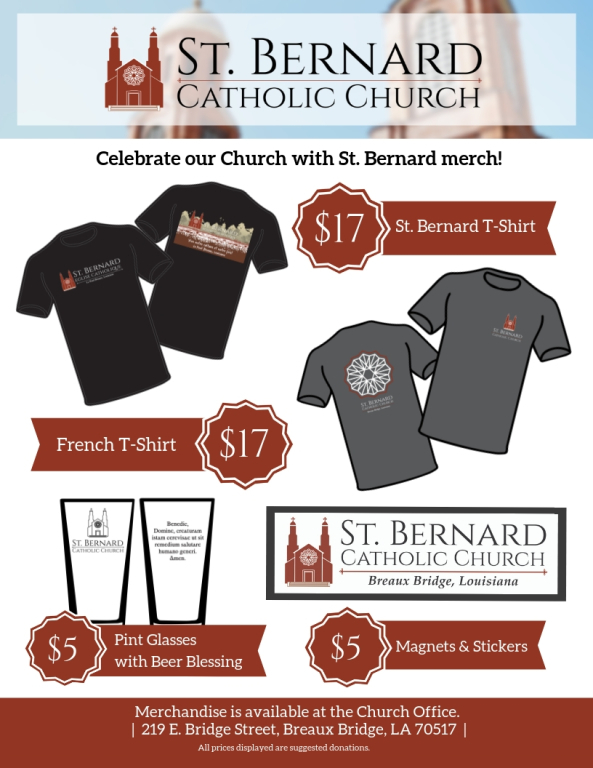 Celebrate our Church - Get some merch! We will be officially launching Flocknote February 16-17. We love having your as part of our St. Bernard “flock”! Let’s keep in touch. 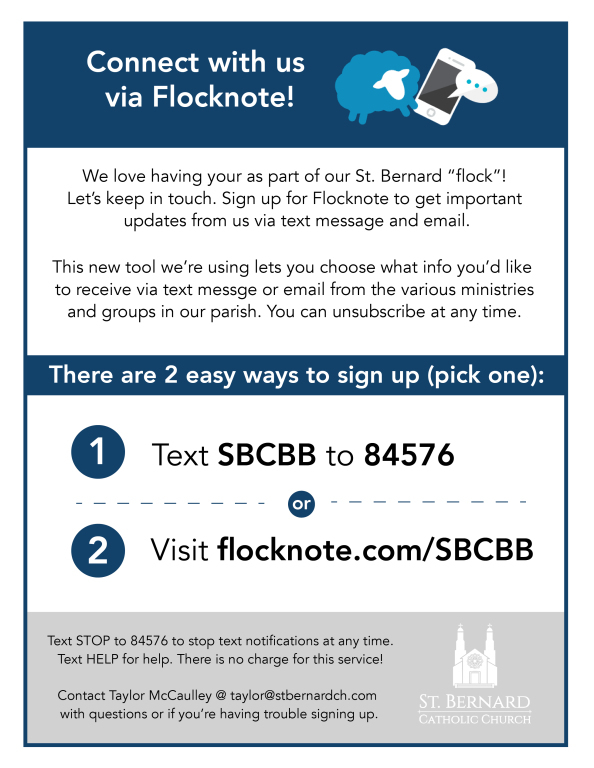 Sign up for Flocknote to get important updates from us via text message and email. This new tool we’re using lets you choose what info you’d like to receive via text messge or email from the various ministries and groups in our parish. You can unsubscribe at any time. 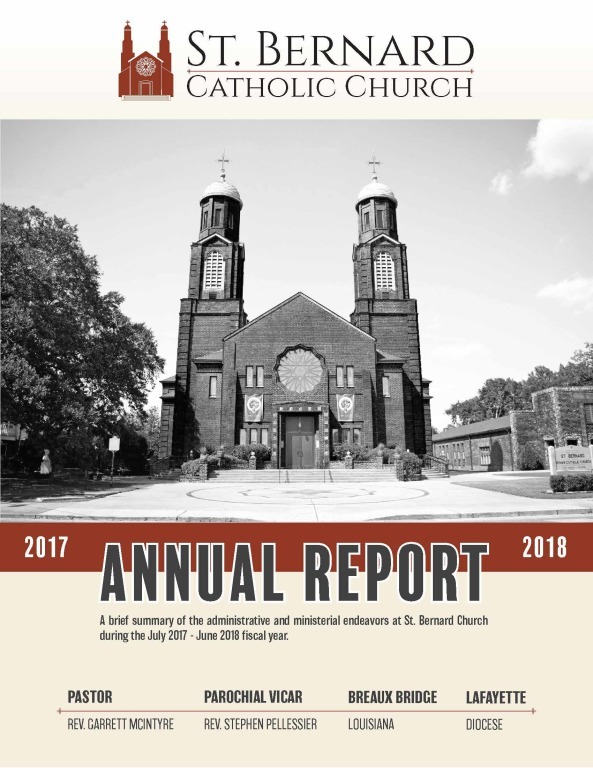 Click here to view the full PDF of the 2017-2018 Annual Report presented to the Parish a few weekends ago. Many thanks to all parishioners for their ongoing support of St. Bernard Church through the generous giving of their time, talent, and treasure. May the Lord continue to bless us as we seek to do His will and help build His kingdom. 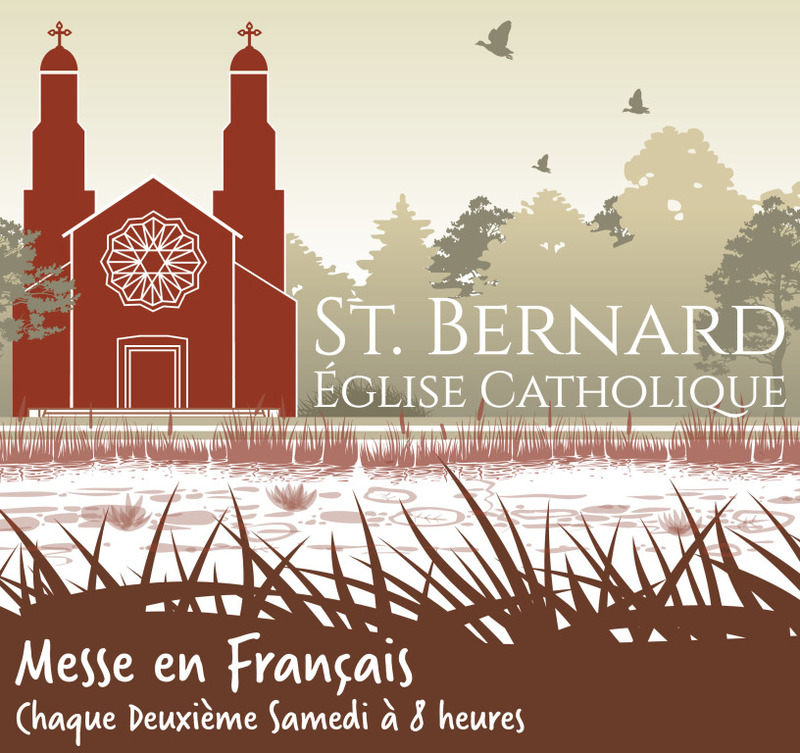 St. Bernard Catholic Church will celebrate a French Mass every second Saturday at 8:00am, beginning September 8, 2018. Join us as we embrace our Catholic, Cajun French heritage. 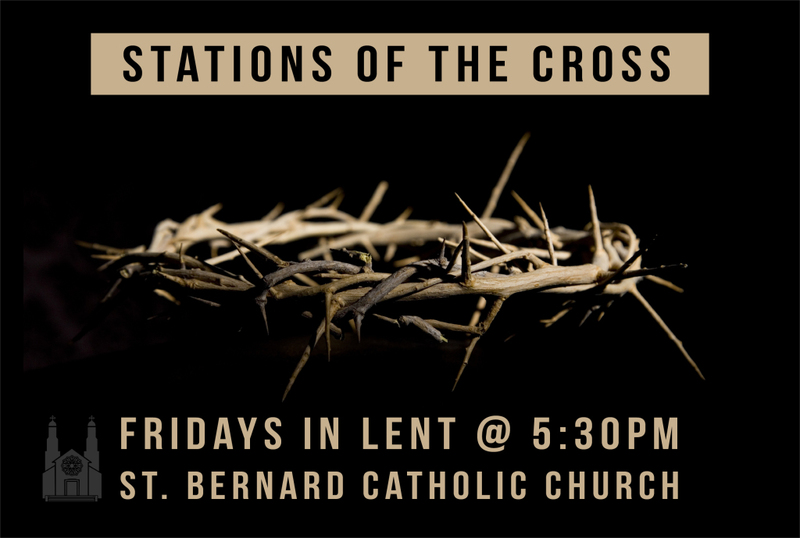 On this Fifth Sunday of Lent, we enter into a more intense period of the Lenten season called Passiontide. We enter into a time where we walk with Christ in his passion and death. The church calls us to solely focus on Christ himself in his passionate love and mercy for us. The church looks very different during this time as we cover the statues and sacred images. We do this remembering the times Christ hid himself from violent sinners in the Gospel and in order to remember the true presence and reality of Christ present among us. Hopefully, these last two weeks of Lent are a time of proper preparation for each of us in anticipation of the celebration of the Paschal mystery during the Triduum liturgies.